Fresh leaves and fruits of A. Tonkinenesis. Photo by Hoang Han. The trees of A. Tonkinesis grow mostly in highland provinces of the North as: Lao Cai, Bac Can, Lai Chau… They can also be found in Hue, Quang Nam, Quang Ngai… Long ago, since “betel begins the conversation”, its roots were important to our people so they usually add A. Tonkinensis roots in a betel quid to be chewed together for. Many Vietnamese traditional medicine documents mentioned that its leaves and roots could be used to treat backache or Metrorrhagia. 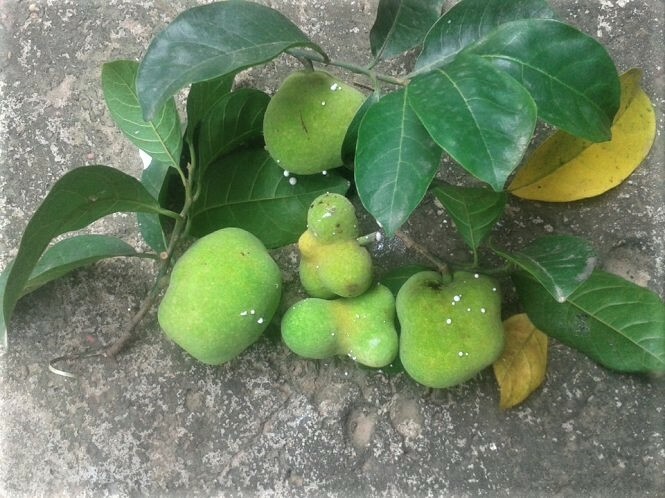 Meanwhile, extraction of A. Tonkinensis ripe fruits with sour flavor and balancing effect can be used as appetizer for better digestion and delicious meal. However, the prominent difference between medicines of the North and the South, as well as the dishes and medicines made from A. Tonkinensis are quite opposite. The first group expresses acrid smell that easy to get bored. The latter group, on the other hand, raises flavorful tangy scent that so stimulating and appealing in the senses of customers. Each style has its own charm that irresistible! Vertical cut of an A. Tonkinensis fruit. Photo by Trung Dung. In the sizzling heat of tropical summer, a bowl of A. Tonkinensis soup made with white-oar fish from flowing streams and thorny bamboo shoot would be better than great! Vo Hieu Trung, photojournalism – a connoisseur in food, living in Hanoi old quarter, but really love travelling far for photo hunting in the cat-ear limestone of the Northwest – said with delightful eyes. Tran Cao Duyen, an editor of Song Tra magazine, from Sa Huynh, Quang Ngai, enthusiastically said: his family usually saves the dried ripe pieces of A. Tonkinensis in earthenware pots for using within a year. From the end of spring in his homeland, young A. Tonkinensis fruits have been growing in the enormous and higher than human’s sights branches. Till the end of summer, the fruits grow as big as the local eggs with lovely yellow-orange skin. The fruits have been raising their tanginess! Pinky pieces of dried A. Tonkinensis. Photo by Nhu Minh. “A. Tonkinensis soup made with small fresh water fish seasoned with Sa Huynh coarse salt, added slightly chopped green bird’s eyes chili pepper. Turn off heat. Add some tamarind to increase the charming gentle tangy flavour. So great!” Duyen breathlessly described, tantalizing listeners about the food. In another recipe, pieces of dried A. Tonkinensis are put on top of small tiny crabs (varunidae, varunid crab) with full of eggs inside their shelves, all cooked in an earthenware. The varunid crabs turn to override the fresh green leaves of piper lolot at the bottom of the pot. Below, the flame quickly heats up the pot. Above, two to three tablespoons of pork fat filled with some cloves of shallot are melting down the food. Reduce heat, put the lid on, and simmer. Finally, season with salt and fish sauce to finish. “You know, it’s mouthwatering delicious!”, said Ton That Lang, living in O Mon District, Can Tho. 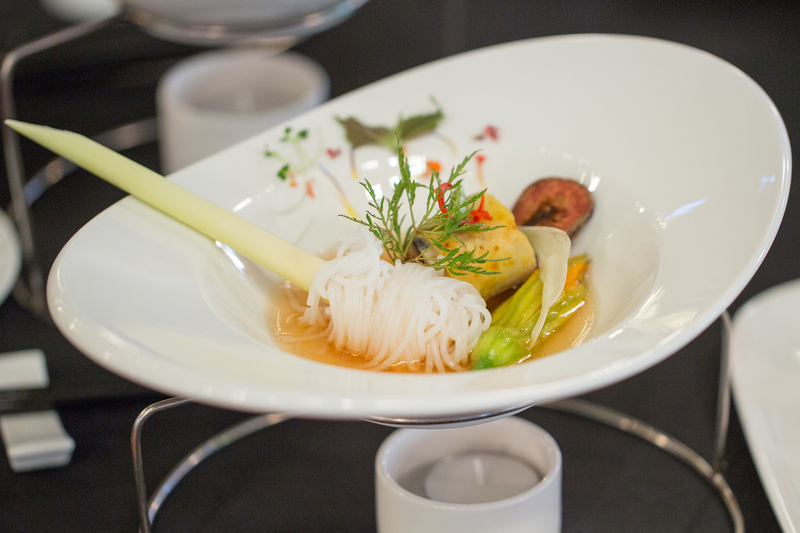 Gà tre (Vietnamese bantam) made with A. Tonkinensis, a dish to be introduced in The Golden Spoon Awards. As mentioned, the trees and fruits of A. Tonkinensis grow naturally. They have been flexibly utilized in traditional food and medicines by our elders through generations. That is so uncountable! But, how to “take advantage of” such precious spice the best, increasing its nutrition as well as the unforgettable taste. Doctor Nguyen Phuc Ung Vien, a traditional doctor of Nguyen Dynasty, had proposed a good but complicated recipe. “A. Tonkinensis fruits combined with wild Giac (leaves and fruits) to make soup, or to be poached with fishes, stir-fried, mixed as local salads… bring out the greatest dishes ever!”, he strongly insisted. 1. Dipping into salted water then taking out, leaving until dry from 1-5 minutes. 2. Dipping into homemade vinegar, taking out and leaving dry as (1). 3. Dipping into alcohol and following as above. 4. Pan-frying glutinous rice until hot, putting Giac leaves and drying until withered a bit. These should be followed to eliminate toxicity, helping medical food promoted its effectiveness as mentioned. Artocarpus tonkinensis A. Chev ex Gagnep, Moraceae family, is the large woody plant with wide branches. Its leaves are similar with fig leaves. 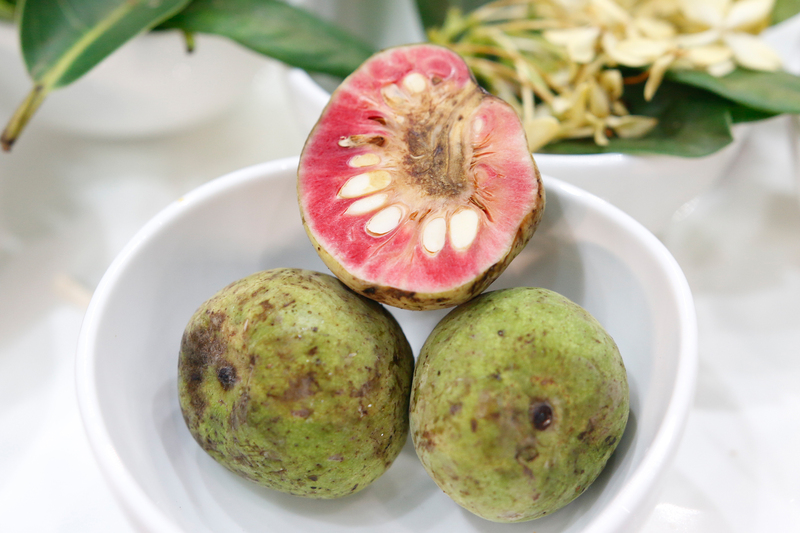 The fruits are round shape with convex and concave, yellow skin when matured, and pinky flesh with sweet and sour flavor. People usually get the fruits for eating then drying for later use. The trees mostly grow in Ha Giang, Thanh Hoa, Nghe An. Young A. Tonkinensis fruits contain lots of tannin, which taste a bit tart but do have stable effects and hemostasis. When matured, the fruits taste sweet and sour containing vitamin C, sugar, organic acid; can be used as appetizer – help better digestion and delicious meal. Its roots only contain tannin, which taste really tart. People usually chew A. Tonkinensis roots together with betel quid (betel and areca), or use them to treat diarrhea and infected wounds. Some researches state that the leaves of A. Tonkinensis have high content of flavonoid with strong antioxidant effect. The researchers are currently proceeded. Ripe fruits of A. Tonkinensis can be served raw, made sour soup, or dried for later use making soup. Folk medicine usually uses raw fruits or their juice to reduce body inner heat symptoms and sore throat, appetite loss. Its roots are used to treat rheumatism, backache, and sore knees with combination of Smilax glabra and Homalomena occulta. To treat menorrhagia, it should combine with Eclipta alba Hassk. Chay root extract can reduce oral problems. Although not any recent document mentions the toxicity of A. Tonkinensis, caution is highly recommended. Its tannin content is not defined which subjected to different individual ability of consumption, therefore, older and children should keep the consumption to a limit as it may cause constipation and enteritis. Pregnant women should avoid using A. Tonkinensis. People using medical treatment for chronic diseases such as heart disease, blood-pressure… need to ask for doctors’ prescription.